I saw the problems at first hand last December, when giving a keynote presentation at the 20th Annual Meeting of Brazil’s chemical industry association. The industry itself is run by people with plenty of energy and vision. But they are let down by a weak and seemingly corrupt political leadership, that blocks progress. Now, of course, Brazil’s problems are starting to impact the wider world. As I noted last week, Brazil’s domestic car market is in crisis, with sales down 44% in Q1 versus 2013. As a result, auto manufacturers are starting to ramp up their exports, which grew 24% versus 2015, and accounted for 1 in 6 of all cars made in Brazil. This would be bad enough in terms of regional impact. But, of course, there is a much bigger impact just around the corner. This month has seen the start-up of 1.05 million tonnes of new PE capacity in Mexico from the Ethylene XX1 JV between Brazil’s Braskem and Mexico’s Idesa. This volume will have attractive economics, being based on advantaged cost ethane from Pemex. As ICIS news reported, sales will be focused on both the domestic Mexican market and internationally. Inevitably, therefore, it will displace more exports from the US – just ahead of the vast expansions due to start up next year. Its production will also boost downstream output from local convertors, adding to pressure in these markets. It is hard to see how all these new volumes can be accommodated without a major price war taking place. And whilst the war will start in Latin America, it must inevitably spread to other regions. Those companies which have lost their sales to Brazil, are already fighting to gain market share elsewhere in order to maintain their volumes. The only solution, as we discuss in ‘Demand – the New Direction for Profit’, is for producers to invest in new business development. Areas such as water and food could potentially absorb major new volumes, if the effort was made to understand their currently unmet needs. Common sense says this needs to be the top item on every CEO and business manager’s agenda. There really is no “business as usual” option, given the tsunami of product that is about to appear. And the the Losers in any price war will almost inevitably go bankrupt. Overall, January’s sales in the 4 countries were down by almost a third, 29%, to 800k. And during the 2008 – 2013 period, when China’s stimulus programme went into over-drive, the 4 countries sold 1 in 5 of all cars sold in the world. 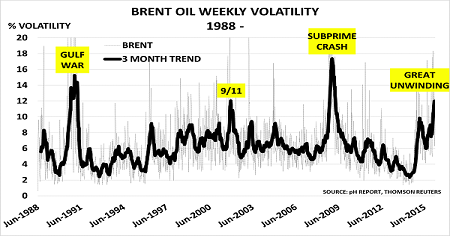 Today, they are back at just 16% of the global total, close to 2005′s level. Its easy to overlook these second order impacts. But they are just as important, perhaps even more important collectively, than the direct impact of the slowdown in China itself. Russia highlights the scale of the reversal. Its real wages (ie adjusted for inflation) fell 11% last year. People don’t buy many cars, or other non-essentials, against this type of background. Yet less than 3 years ago, just as the bubble burst, Boston Consulting had forecast it would be the world’s 5th largest market by 2020, with sales of 4.4m. “It’s the last thing you should do because you buy this asset, it depreciates fairly rapidly, you use it 3% of the time, and you pay a vast amount of money to park it for the other 97% of the time”. This paradigm shift is one of the main topics in our new Study – “Demand – the new direction for profit”, which will be published early next month. In it, we focus on describing the new business models needed for future success, and detail practical ways of using these to develop major new revenue and profit streams for the future. The world, as we see from the second order impacts of China’s slowdown, is dividing into Winners and Losers. There really is no going back to the BabyBoomer-led economic SuperCycle. And whilst all change is uncomfortable, the experience of Japan, Russia and Brazil suggests that failure to change can produce an even more unpleasant result. I am just back from Sao Paulo, Brazil, where I was giving a keynote presentation alongside Brazil’s Finance Minister and other senior figures at the 20th Annual Meeting of the Brazilian chemical industry association, ABIQUIM. As a result, Brazil’s median age is set to nearly double from 19 years in 1950 to 37 years by 2030. In the past, Brazil always had the reputation of being ‘the country of tomorrow’. Brazilians would all agree that things weren’t perfect “at the moment”, but believed they were about to improve. And for a period, during the China boom decade, it seemed as though this confidence was well-founded. Today, however, the picture is not so rosy. The good news, however, is that Brazil’s chemical industry – like other key parts of the economy – is run by people with plenty of energy and vision. If the dead-weight of corruption and political cronyism could be removed, then it could move ahead very strongly. Brazil is, after all, the 6th largest chemical industry in the world, with a domestic market of over 200m people. In addition, I heard very positive comments from senior executives on the new administration in Argentina. President Macri has only been in power a few days, but is already moving fast to try and clear up the mess he has inherited. And elsewhere in the region, the opposition victory in Venezuela’s parliamentary elections is spurring hope that political change might finally be underway – although political crisis is likely to be the immediate result. It is no exaggeration to say that a continuation of the status quo would be a disaster for Brazil. But real and sustainable change is possible if leaders come forward who focus on sensible policies rather than slogans. Such a change would also make a major difference in the rest of the continent, and support those in Argentina, Venezuela and elsewhere who are trying to change the failed policies of the past. Hi data for auto sales in world’s top 7 markets is confirming my suggestion last October that global auto sales had reached their “top of the mountain moment“. Total volume was down 2.1% versus 2014, with sales in Russia and Brazil showing major downturns. 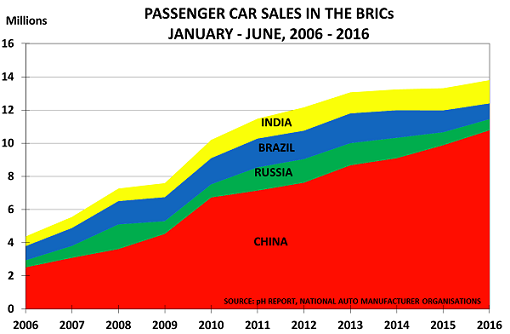 As the chart shows, the sales decline is focused on the BRIJ nations (Brazil,Russia, India and Japan), where only India is now in positive territory. Russia is the worst affected, with sales down 41% versus 2013 and 37% versus 2014. It has been hit by lower oil prices and the Ukraine-related sanctions. Ford have now joined the list of foreign companies having to recapitalise their business. And Russia’s Industry Ministry and Boston Consulting Group analysis suggests recovery could take till 2020. One sign of the liquidity problem is that used car sales are down 24% at only 1.8 million. Brazil is also badly affected, with sales down 26% versus 2013 and 20% versus 2014. It has been hit by China’s slowdown, which has impacted its major commodity exports. Around a quarter of the economy depends on the auto industry and already 10k employees have been laid off, with 36k on paid leave – even so, inventories have risen to 55 days. Dealers’ association Fenabrave now forecasts a 23% fall in total 2015 sales – equaling 1998′s collapse after the Asian crisis. Japan saw sales down 3% versus 2013 and 12% versus 2014. Its key problem is its ageing population – older people drive less than when they were young, as they no longer drive to work once retired or need to act as a taxi service for children. Auto sales thus confirm the lack of logic behind Premier Abe’s vast stimulus programme. People brought forward auto purchases in Q1 2014, in advance of April’s sales tax increase. But contrary to the government’s expectation, sales have still not rebounded after this downturn. India remains the bright spot amongst the 4 markets, with sales up 6% versus both 2013 and 2014. Its 1.34m volume means it has now overtaken both Brazil (1.27m) and Russia (0.8m), and is heading back towards its peak year of 2012. But it will take a long time for car sales to catch up those of motorbikes, which continue to dominate the market at 81% of total sales: car sales are currently at just 13%. One interesting development is Eicher Motors‘ launch of a diesel truck that doubles as a miniature power station. Retailing at just Rupees 232k ($3645), its 3kW supply could be ideal for wealthier homes and small businesses amongst the 300m Indians who lack reliable electricity supplies. Russia is again the world’s worst-performing auto market, with sales down 40%. Mercedes is the best performing brand, with sales down only 6%, whilst Lada, Hyundai and Kia are down between 14% – 22%. The other top 10 brands are down by over 50%. Brazil sales were down 19%, with April seeing a worsening trend as sales fell 25%. The market should, of course, be doing very well in the run-up to the Olympics next year, but instead the economy has gone into recession as China’s downturn impacts its previously buoyant commodity exports. In addition, the Petrobras corruption scandal continues to throw a shadow over the government. India remains the only relatively bright spot, with sales up 8%. But as Team-BHP comment ”Going forward, Auto CEOs are a bit cautious, as the rural outlook isn’t bright. 2-wheeler sales are the best indicator of the rural market, and they’ve been nothing to write home about in April.” And, of course, as I noted yesterday, India’s car market has been going nowhere for 4 years, so it is hard to be too optimistic about the outlook.